Featuring carved solid spruce top, solid maple back and sides, inlaid purfling, blackened rosewood fingerboard, rosewood pegs and chin rest, red label strings, alloy tailpiece with four string adjusters, nylon tailpiece loop. polished brown laquer finish. 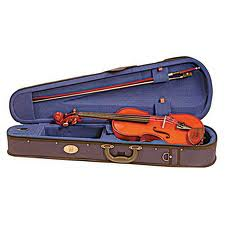 includes wood horsehair bow and lightweight canvas covered case with exterior shoulder rest compartment.